Canal Crossing Apartments, located in downtown New Orleans, is a 400,000 square foot, nine-story residential building that houses 330 apartments and provides a 187,000 square foot parking garage with 500 parking spaces. The city of New Orleans stormwater zoning ordinance requires the first 1.25 inches of stormwater runoff to be detained, filtered, and infiltrated through the use of BMP’s. Traditional BMP’s could not be used on this site because it is located in an urban area, hence there are space constraints. Approximately 60% of the drainage area is the roof and 40% is the parking deck. The engineer utilized an above ground tank to meet the storage requirement and needed a solution that could meet the treatment objective. After considering the options, the engineer choose the Stormwater Management StormFilter from Contech Engineered Solutions. The StormFilter uses rechargeable, media-filled cartridges to absorb and retain the most challenging pollutants from stormwater runoff including total suspended solids, hydrocarbons, nutrients, metals, and other common pollutants. 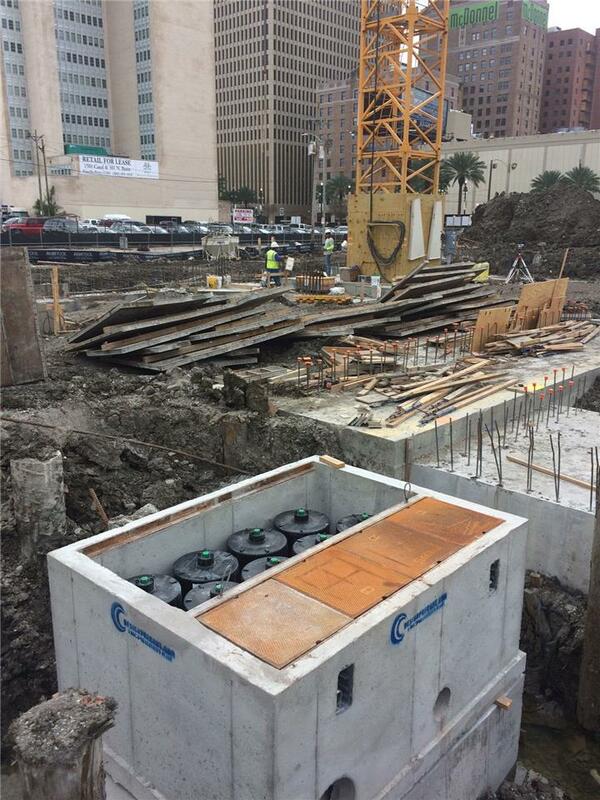 A 8’ x 6’ linear grate vault was constructed to house nine, 27” StormFilter cartridges with ZPG® media. ZPG a proprietary blend of zeolite, perlite, and granular activated carbon to target a wide variety of pollutants, such as TSS, soluble metals, and other pollutants. The linear grate vault configuration uses removable covers that provide easy access to the StormFilter cartridges, and no confined space entry is required for maintenance. The design flexibility, the third party, verified removal efficiencies and the laboratory and field-proven maintenance cycle made the StormFilter the perfect choice for this application.